Bushes are not allowed to be planted at the gravesite. Rose bushes cannot be planted on the cemetery grounds. Superintendent in the location of his choice. No plantings of any kind will be permitted at the gravesite. Perpetual care is mandatory for all grave purchases. Perpetual care is a gift to the families who use graves in Babyland. Only one stone is permitted per grave. 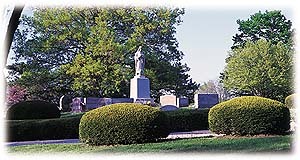 Greenmount Cemetery reserves the right to remove any stone which would be in conflict with Christian principles and practices.